Powerpoint presentations are often printed as handouts so that audiences can follow along, or if a group of people are collaborating on a presentation and need to take physical notes instead of working on the digital file. But the default print setting in Powerpoint 2013 will print every slide on its own page, which can waste a lot of ink and paper. Fortunately Powerpoint 2013 provides you with the ability to print multiple slides on one page. 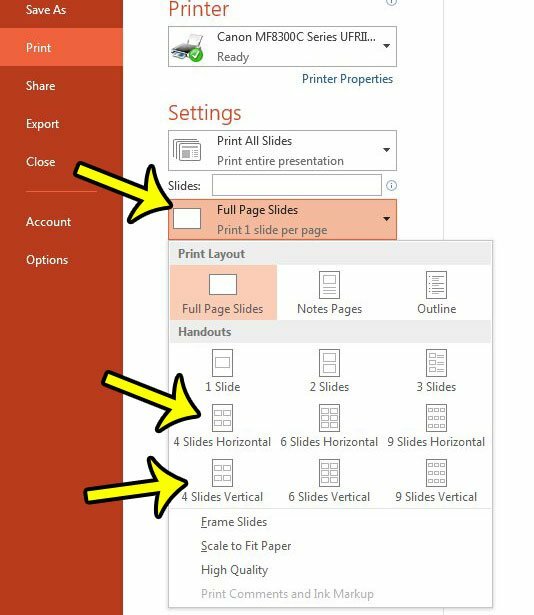 There are two options available to you as a Powerpoint 2013 user when it comes to printing 4 slides on a page, so continue reading below to learn what each option means so that you can select the one that best meets your needs. 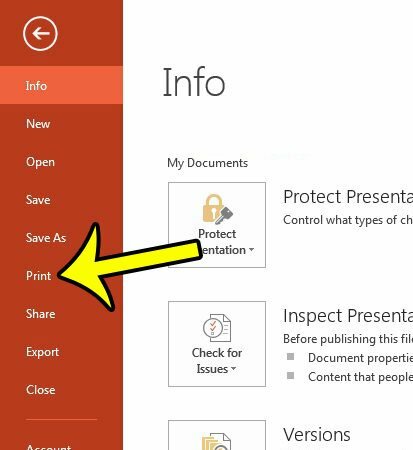 The steps in this article will show you how to change the Print settings for your currently-open Powerpoint presentation. We will be printing 4 pages on one page, and you will have the option to choose between “4 Slides Horizontal” and “4 Slides Vertical.” The ordering of the slides will vary depending upon which option you choose. 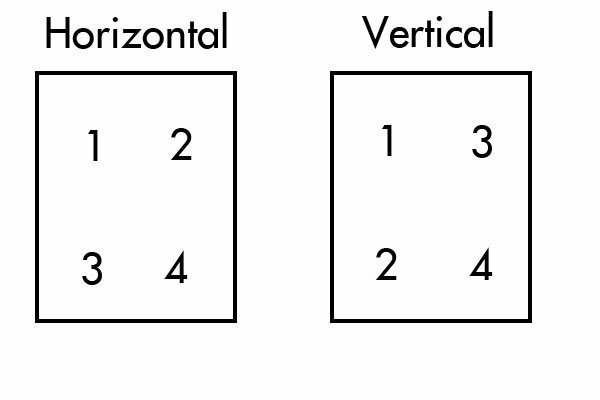 The image below indicates the positioning of your slides, by number, based on selecting either the horizontal or vertical option. Click the Print option in the column at the left side of the window. Note that you can alternatively open this menu more quickly by pressing Ctrl + P on your keyboard while you are in the regular Powerpoint interface. Click the Full Page Slides button in the Settings section, then select either the 4 Slides Horizontal or 4 Slides Vertical option. You can refer to the image at the beginning of this tutorial concerning the layout of these two choices. 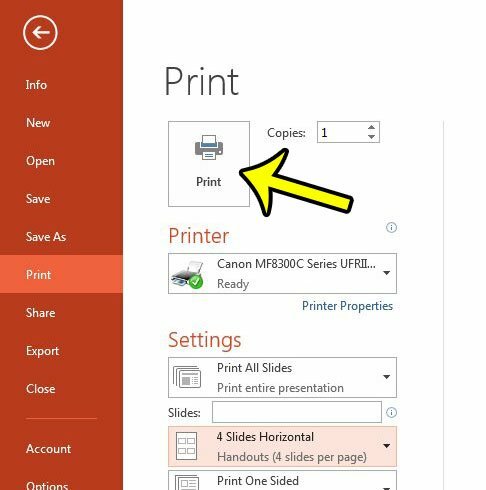 Click the Print button at the top of the window to print your slides with your selected configuration. Would you like to change the page orientation for the slides in your presentation? 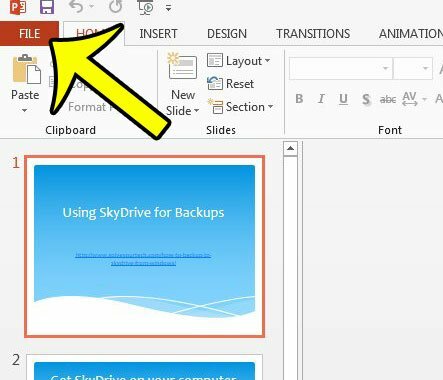 Learn how to switch between portrait or landscape orientation in Powerpoint 2013 if your slideshow would be more effective with a different orientation.